On the S-shaped land, there are countless majestic landscapes, but the coastal fishing villages have always been the destination for those who desire to explore. If having a chance, let’s come to explore top 7 beautiful fishing villages below! 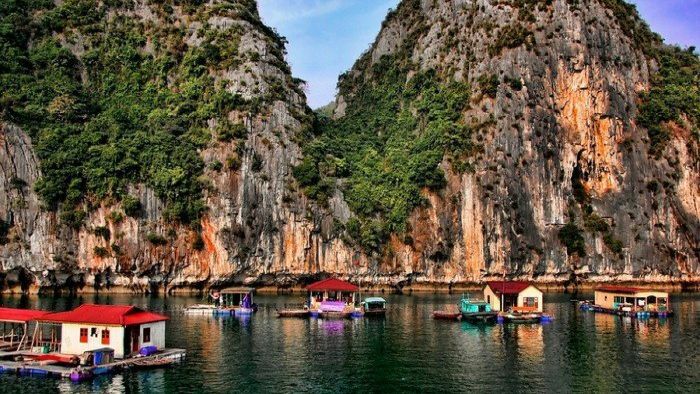 Located in the heart of Ha Long Bay, Cua Van Fishing Village is always a hot spot for both domestic and international tourists. A visit to this village is a great opportunity to soak up the calm and atmosphere of nature which is combined with rocks, mountains, water, and sky. The most prominent feature of the village is the charm of houses floating on the sea surface. Besides, the simple lifestyle of local fishermen will give you a different view of the sea beauty that is not empty and bored. 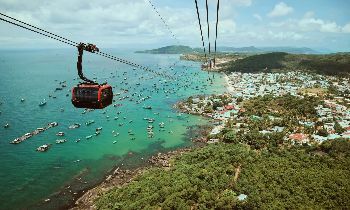 Cai Beo fishing village is also known as Vung O fishing village located in the sea of Pearl island, Cat Ba archipelago, Hai Phong city. This is one of the most ancient fishing villages of Vietnam which was named on the list of national relics in 2009. Many people said that this is one of the rare places in the world has the perfect combination of natural beauty and cultural relics. 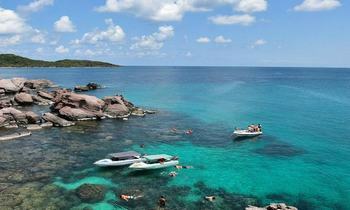 From afar, Cai Beo bay appears very beautiful with the clear-crystal water, strange-shaped mountains, and blue sky. The poetic beauty of nature blending with the bustling life in the fishing village has created an attractiveness for tourists. 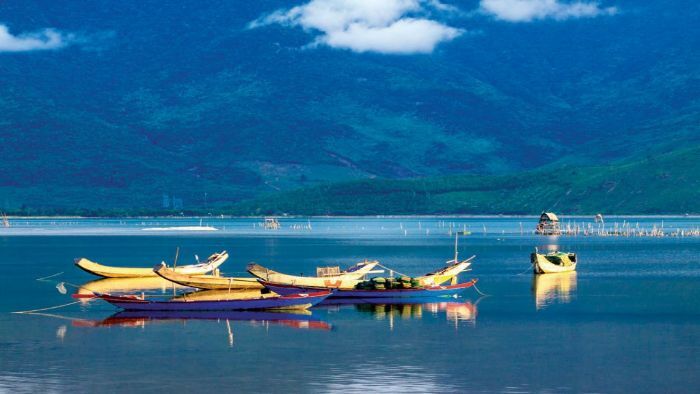 When you come to Cai Beo fishing village, you can rent a boat to explore the peaceful life of the fishing villagers and freely admire the poetic scenery of Cai Beo bay as well as enjoy specialties made by the fishermen. 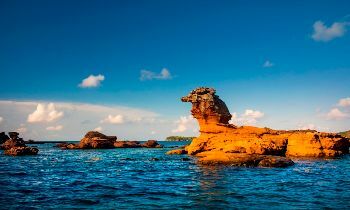 The sea area in Quang Tri is not too prominent compared to other places, but, the wildness and tranquility of the landscape are also enough to attract a large number of domestic and foreign tourists to visit this place. When coming to Quang Tri, do not forget to spend a day to experience at Cua Tung fishing village - one of the most poetic fishing villages in Vietnam. This is where the historical Ben Hai river flows into the sea. With gentle sky and cloud scenery combined with the clear blue water always rippled, visitors will have relaxing and comfortable moments in Cua Tung fishing village. Lang Co is the name of a poetic fishing village located at the foot of the Bach Ma mountain range running to the South China sea. 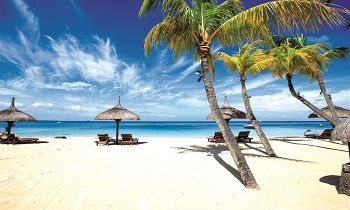 In 2009, Lang Co was recognized by the Club of the Bay as one of the most beautiful bays in the world. 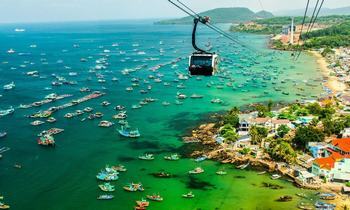 Seen from above, the fishing village looks like a silk winding between Phu Gia and Hai Van passes. 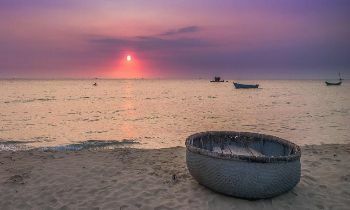 Thanh Nam is a small but beautiful fishing village located on Cua Dai beach, Hoi An ancient town. The village especially attracts photographers and people who need silence. 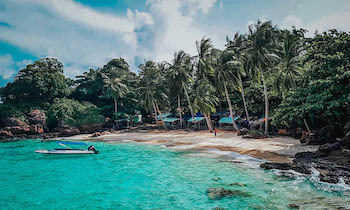 The fishing village is located along the road leading to the island bay with white sand beaches and clear blue water which gives visitors a pleasant feeling. Here, despite being poor, people are extremely friendly, rich in love and hospitable. Being the largest island commune of Nha Trang city located in Hon Tre island cluster, Bich Dam fishing village is a peaceful fishing village in the middle of the turquoise waters all year round. Because tourism has not yet been exploited, nature here is wild. The scenery and people in this fishing village are peaceful and simple. You can walk around and explore the lives of fishermen by yourself. Luckily, visitors also have the opportunity to go fishing with fishermen. 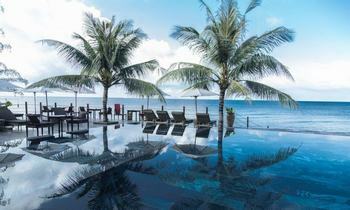 If you love Phu Quoc island, you must have known the name of Ham Ninh fishing village. 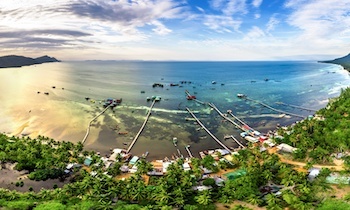 This is one of the few fishing villages in Phu Quoc having the mixture of the sea and mountains. There is a gentle blend between the moss green of the mountain and the blue color of the sea. 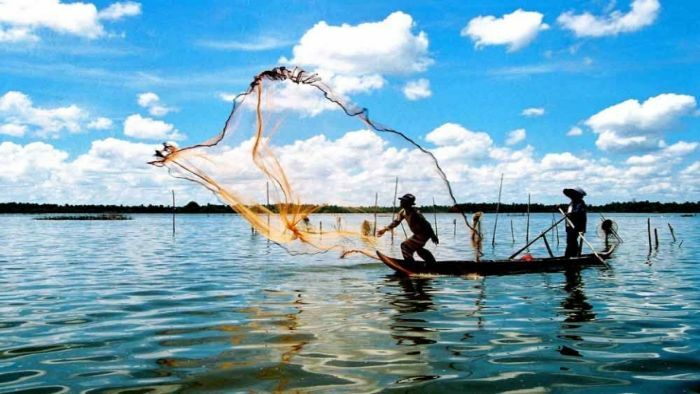 Ham Ninh fishing village is much more popular with tourists where the village is known as a culinary paradise in Phu Quoc. Here, you can enjoy a variety of seafood with the most attractive prices. Away from the bustling cities, you will find out the peaceful moments in the beautiful fishing village. Enjoying the seascape and transforming into real fishermen are what you certainly have when visiting one of these fishing village above. If you have any question about tours, don’t hesitate to contact us. Thank you!